2 Combine Hellmann's® or Best Foods® Real Mayonnaise, mushrooms, cranberries and milk in large microwave-safe bowl. Microwave at HIGH 45 seconds; stir. Stir in hot peas, then turn into greased 1-quart shallow casserole. 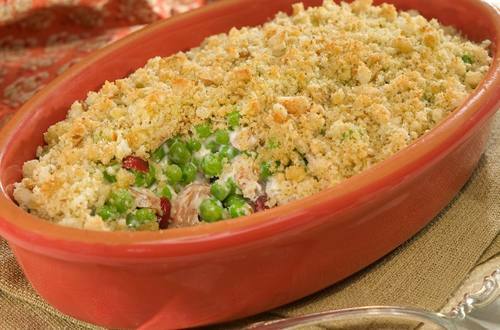 3 Combine stuffing mix with Country Crock® Spread in a small bowl, then sprinkle over pea mixture. Bake 10 minutes or until golden brown.